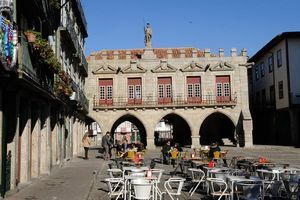 Discover the Ancient Paços do Concelho (Old County) in Guimarães, Portugal. The Ancient Paços do Concelho, or Old County from the 14th century, is located in a gallery which connects Largo da Oliveira to Santiago square, in the historic center of the city of Guimarães. Today, it houses the delegation of tourism, culture and heritage of Porto and North of Portugal. Largo da Oliveira - Edifício dos Antigos Paços do Concelho, Guimarães, Portugal.